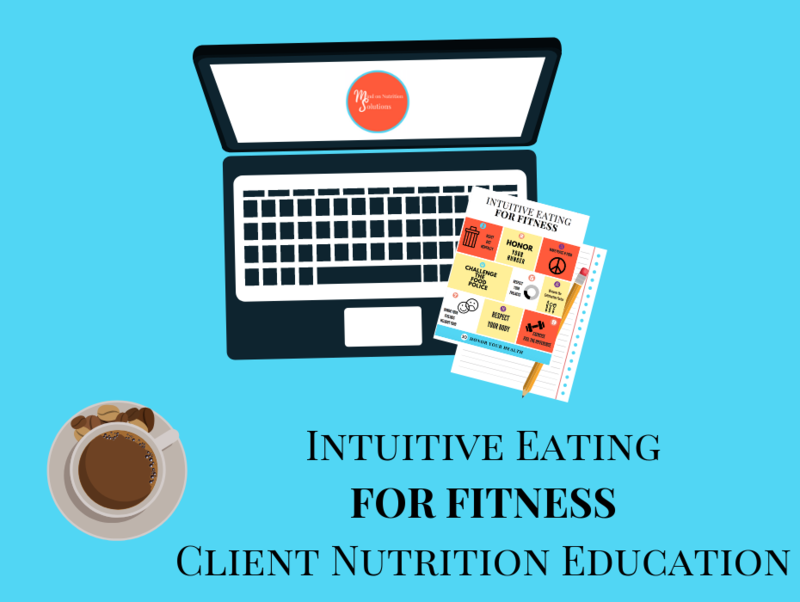 Client Nutrition Education Material to help your fitness nutrition clients incorporate intuitive eating while on a sport-specific nutrition protocol! If you’re an RD in gyms & fitness studios but want to incorporate intuitive eating in your athlete’s protocols here is the resource for you. Let’s be honest. When gym & fitness studio members are goal-oriented, they want to perform and perform well. That may require specific nutrition protocols that facilitate body composition changes that are part of the sport. We may be teaching them how to reach their carbohydrate intake, we may have them adjust their protein intake to grow lean body mass. There is macronutrient manipulation that is part of every sport so how do we as fitness dietitians help our clients adopt a healthy nutrition pattern without getting disordered thoughts about eating? We have to teach them Intuitive Eating alongside Macronutrient Counting. This resource is 3 pages. Page 1 is a colorful infographic that lays out the 10 In unitive Eating Principles. Show this to your clients during their Initial Consultation to set the expectation up right away that this is just as important as hitting their nutrition needs. Pages 2 and 3 explain more depth how these principles relate to their lifestyles. Buy This 3 page Nutrition Education Material & the Calorie Nutrient Density Matrix for a winning combo of private practice materials. Product Terms and Conditions Mind on Nutrition Solutions is created to bring MORE evidence based nutrition solutions into the hands of the public. The content created is from an RD for RD's to launch their private practice in gyms & fitness studios in their communities. The content created and sold at Mind on Nutrition Solutions are tried, true & tested in gyms and fitness studios in Denver, CO. Watch this space for more interactive challenge, workshops, nutrition seminar talks and nutrition education handouts that you can use to elevate your business in gyms and fitness studios! 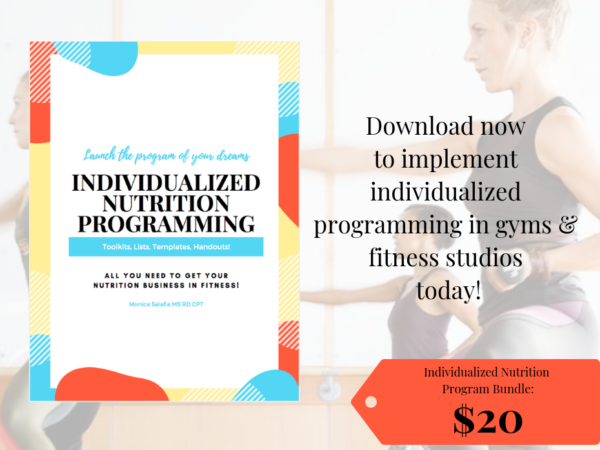 Fitness Dietitian: Individualized Nutrition Programming Bundle! Mind on Nutrition Solutions is created to bring MORE evidence based nutrition solutions into the hands of the public. The content created is from an RD for RD's to launch their private practice in gyms & fitness studios in their communities. The content created and sold at Mind on Nutrition Solutions are tried, true & tested in gyms and fitness studios in Denver, CO. Watch this space for more interactive challenge, workshops, nutrition seminar talks and nutrition education handouts that you can use to elevate your business in gyms and fitness studios! The pdf document referred to another document that obviously I did not have in my possession…it recommends readers to “Use the Calorie/Nutrient Density Matrix©” So basically I paid for a pdf that in order to use I would have to entirely recreate. Not helpful. Hi! Thanks for your feedback so just to be clear you find the entire resource unhelpful because the Calorie Nutrient Density Mateix was not there? Then you are in luck 🙂 That’s actually a separate download. I appreciate your feedback because this means 2 things : 1 I can send you that material so you do find it to be helpful. And 2 I can write in my product subscription make sure the person downloads that too:)! Was there anything that was helpful? I will move that to the top! Once that is sotuated would you mind revising your review so that way people do not think the entire document is unhelpful? I would really appreciate that and I really am glad you said something.